Now available from Kubota Tractor Australia , the M8540 narrow tractor in a Rops version is ideal for customers that work in narrow and tight applications like orchards, vineyards and poultry sheds. 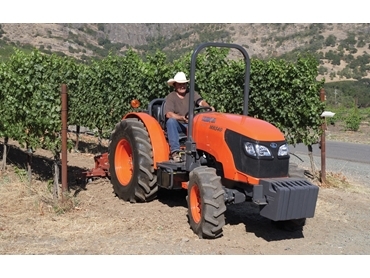 Kubota engineers took the requests of Australian farmers into consideration when designing the new 85 horsepower M8540 narrow tractor. A visit to vineyards and orchard farms revelaed that existing narrow tractor owners and operators wanted a a powerful compact tractor, with good manoeuvrability, while being reliable and keeping running costs low. Kubota’s new turbocharged four valve Tier 3 compliant four cylinder center-direct injection diesel engine, is built to deliver plenty of power when pulling heavy trailers up steep hills or running PTO driven mulchers. The M8540 narrow tractor's hydraulic shuttle transmission is designed to achieve the best efficiency and productivity, with a five speed synchronized gearbox and three ranges including creep speed. The tractors top speed is rated at 38km/h. Wet disc brakes are maintenance free and enhance the brake stopping power of the tractor over dry brakes. When the brake pedal is applied, the tractor automatically engages four wheel drive 4WD, even if the tractor is in two wheel drive 2WD mode. The PTO and 4WD are electric over hydraulically operated and are engaged by the push of a button. Standard PTO speeds of 540/540Economy, allow for light to medium duty PTO implements to be run at lower engine rpm to reduce noise levels and save fuel. Kubota’s exclusive Bi-Speed Turn feature rotates the front wheels at a speed of almost twice the speed of the rear wheels, whenever the front wheels exceed a turning angle over 35 degrees. The result is a smooth, extremely tight turn into the next crop row on the first attempt, which is ideal for vineyard and orchard work. The three point linkage with its external lift cylinders lifts up to 2300kg at the category (2) ball ends. Two rear lever controlled remote control valves come standard, with an option to equip a third valve or flow control valve. The open operator platform of the M8540 narrow tractor is protected by a mid mount 2 post foldable Rops frame. The platform offers plenty of room around the leg and seat area. All hydraulic and PTO control levers are positioned within easy reach of the operator. The slanted metal bonnet offers high visibility to the front of the tractor. Of critical importance when operating Rops tractors is a low engine noise level to reduce operator fatigue. Kubota’s modern engine design is only 84db (A) at the operators ear. With a wheelbase of 2050mm, overall width is a narrow 1490mm on the standard 420/70R24 rear tyres or 1430mm on the optional 380/70R28 rear tyres. The M8540 narrow tractor measures a minimum height of 2240mm while this is reduced to 1635mm when the Rops frame is folded down. Maintenance on the M8540 narrow tractor is very simple with only a few daily service checks required. The easy to reach double fuel tanks hold 60L of diesel and are made out of metal rather than plastic material to reduce damage from thick prunings.